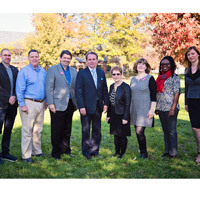 From left to right: Jesse Alexander, Vienna; Phil Gwaltney, Thailand; Ted Hoef, St. Louis; Julian Schuster; Beth Stroble; Christine Benninger, Leiden; Adelina Martey, Ghana; and Kristina Shimkus, Geneva. Webster University student life coordinators from the Geneva, Vienna, Leiden, Thailand, and Ghana campuses met at the Webster Groves campus Nov. 14-18 as part of efforts to improve and synchronize the global student-centered experience called for in Webster's strategic plan, "Global Impact for the Next Century." During their week in St. Louis the group met with student affairs staff from the home campus, as well as President Beth Stroble, Provost Julian Schuster, and representatives from many other offices. Their visit was timed to coincide with St. Louis hosting the annual regional conference of NASPA, a national association of student affairs administrators in higher education. Webster attendees from abroad included Jesse Alexander, Vienna; Phil Gwaltney, Thailand; Christine Benninger, Leiden; Adelina Martey, Ghana; and Kristina Shimkus, Geneva. Ann Gwaltne from the Thailand campus also visited with Gladys Smith concerning her role as the sexual offense advocate for the Thailand campus. Their meetings covered a long list of discussion topics selected by the attendees for their relevance to student affairs work on each campus, including: student government, student leadership development, student conduct and Title IX, safety and crisis management, co-curricular programming, alcohol and drug prevention, best practices, study abroad, career development, faculty engagement, the global student leadership summit, and future collaboration/information sharing. Many that attended stated that these discussions were incredibly useful and relevant for everything they do on a daily basis at their respective campuses. Everyone also attended the NASPA IV West/East Regional Conference at Union Station in downtown St. Louis, where they were welcomed and introduced to the 700 attendees from this national student affairs organization. "The NASPA conference was a wonderful addition to an already great wee," one Webster attendee said. The group also had a brief meeting with the new directors from the metro and military campuses who were also in St. Louis that week for similar initiatives under the strategic plan. Another goal the visit achieved was creating strong professional and personal bonds between these global student life colleagues. Those that participated left with not only practical skills but also familiarity with a team that they can rely on in the future. With the coming together of many different countries and cultures, this meeting fostered a global connectedness between many different Webster University staff.